NOTE: Many books have been written about Galileo, and, in particular, about his interaction with the Church. An excellent short biography is Galileo, Stillman Drake, Oxford. Drake has also written Galileo at Work: His Scientific Biography, Dover. 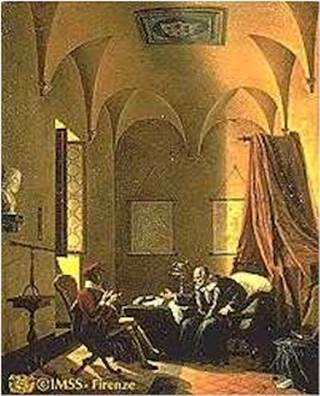 An enlightening book on the social context, and Galileo's adaptation to it, is Galileo Courtier by Mario Biagioli. One classic is The Crime of Galileo, Giorgio de Santillana, 1955, University of Chicago Press. A fairly recent biography by a journalist is Galileo, a Life, James Reston, Jr., HarperCollins. Galileo was born in Pisa, Tuscany in 1564, the son of Florentine musician Vincenzio Galilei. Actually, Vincenzio was a revolutionary musician—he felt the formal church music that then dominated the scene had become sterile, and that classic Greek poetry and myths had a power the church music lacked, that perhaps could be translated into modern music. He attempted some of this, and his work began the development that culminated in Italian opera. Vincenzio wrote this in the introduction to Dialogue on Ancient and Modern Music (Google books). But Vincenzio Galileo ridiculed this theory—he could play a note just half way between! In other words, he took a practical rather than a theoretical approach to music: what sounds right trumps any abstract mathematical discussion of music. In fact, this was a very old argument: Vincenzio Galileo was following Aristoxenus (4th century BC Greek) instead of Pythagoras—see his book,Dialogue on Ancient and Modern Music. . It was also widely believed that if the tension in a string was doubled, that would be the same as halving the length at constant tension—another example of the linear/ratio/proportion mentality, probably from Aristotle. And, it wasn't difficult to believe: the tension was varied by tightening the string until it sounded right, there was actual measurement of tension. Vincenzio proved, by hanging weights on strings, that in fact the tension had to be quadrupled to have the same effect as halving the length. So Galileo was brought up to believe that theoretical claims needed to be checked experimentally and, in particular, simple linear rules might not always be right. At age 17, Galileo went to the University of Pisa. He enrolled as a medical student, following his father's advice, but turned to math, after persuading his father that he didn't want to be a doctor. His father allowed him to be tutored by the Tuscan court mathematician, Ricci, who designed fortifications, which no doubt impressed Galileo (Reston, page 15). When he was eighteen, Galileo watched a lamp being lit in the cathedral at Pisa. (Fahie, page 9; but apparently Fahie is wrong on one (irrelevant!) 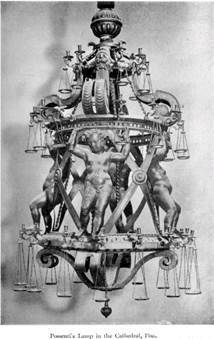 detail, the Possenti lamp he shows was only hung a few years later.) These cathedral lamps were very ornate affairs, with many candles. The lamplighter would pull the lamp towards himself, light the candles then let it go. Galileo watched the swinging lit lamp for some time. He timed its swinging with his pulse, and realized that the period of one swing stayed the same, or very close to the same,as the swings became smaller and smaller.He realized this constancy of swing time could be used to measure a patient's pulse in hospital. (This was before watches had been invented—even pendulum clocks came a little later, both Galileo and Huygens developed the concept. Huygens was better.) 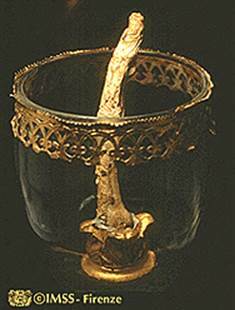 Anyway, Galileo, working with a physician friend Santorio, constructed a simple device, which became known as a pulsilogia, and became widely used. Basically, it was a pendulum of adjustable length, the length being set by the physician so the swings coincided with the patient's pulse, a built-in ruler than read off the pulse rate. Galileo proved to be an extremely talented mathematician, and in his early twenties he wrote some tracts extending results of Archimedes on centers of gravity of shapes. At age 25, he was appointed to the Chair of Mathematics at Pisa. His job interview was to give two lectures to the Florentine Academy on mathematical topics. This Academy's main function was to glorify the Medicis, the ruling family, and of course Florence itself. 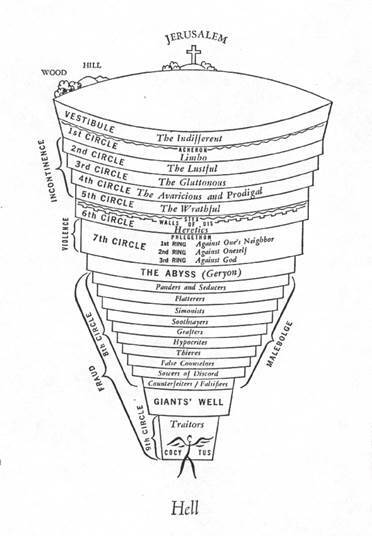 Now Dante was to Florence what Thomas Jefferson is to Charlottesville, only on a bigger scale: perhaps his most famous work was his delineation of hell in Dante's Inferno. Hell started below ground, and continued down to the center of the earth. In contrast to heaven, out there somewhere and doubtless made of aetherial material, Hell was constructed of familiar stuff, so could be mathematically analyzed, like any architectural construction. Galileo presented his lecture as a description of two different plans of hell, one by Antonio Manetti, a Florentine, and one by Alessandro Vellutello, from Lucca, a rival city. Manetti's Hell extended 8/9ths of the way from the Earth's center to the surface,Vellutello's only one-tenth of the way, giving a much smaller volume available, as Galileo pointed out.He showed off some of his new mathematical results here: the volume of a cone goes as the cube of its height, so the factor of about 10 difference in height of the two hells meant a difference of about a thousand in volume. People had been skeptical of Manetti's hell, though: they doubted that vast arched roof could hold up against gravity. Galileo argued that this was no problem: the dome in the cathedral in Florence held up beautifully, and was relatively thinner than the 405 miles that Galileo estimated to be the thickness of Dante's cover. The lectures went over very well, and he got the job.But then it dawned on him that he'd made a mistake, and his whole analysis, comparing the roof of hell with the cathedral, was seriously flawed.He kept very quiet. No-one else noticed. We'll return to this important point later. At age 28, in 1592, Galileo moved to a better position at Padua, in the Venetian Republic, where he stayed until the age of 46. Reston's book certainly paints a vivid picture of the Venetian Republic at the time Galileo moved there! Venice, a city of 150,000 people, apparently consumed 40 million bottles of wine annually. There were more courtesans than in Rome.In 1599, Galileo met one Marina Gamba, 21 years old. He had three children by her, greatly upsetting his mother. Galileo also spent a lot of time with Sagredo, a young Venetian nobleman, both in the town and at Sagredo's very fancy house, or palace.Sagredo is featured as one of the disputants in Dialogue Concerning the Two Chief World Systems, and Two New Sciences. Another close friend during this period was Fra Paolo Sarpi, a Servite friar, and official theologian to the Republic of Venice in 1606, when Pope Paul put Venice under the interdict. Tensions between Venice and Rome were partly generated because Venice wanted to be able to tax churches built in Venice by Rome. Sarpi advised the Venetians to ignore the interdict, and the Jesuits were expelled from Venice. A nearly successful attempt on Sarpi's life was generally blamed on the Jesuits (from Drake, page 28). When Galileo was 46 years old, in 1610, he developed the telescope, secured tenure and a big raise at Padua, then went on to make all the discoveries announced in Sidereus Nuncius: mountains on the moon, the moons of Jupiter, phases of Venus, etc. By naming the moons of Jupiter after the Medici family, Galileo landed the job of Mathematician and Philosopher (meaning Physicist) to the Grand Duke of Tuscany, and was able to return to his native land. This move upset his friends in Venice who had worked so hard to secure his promotion at Padua only months before. Of course, Galileo's belief that his discoveries with the telescope strongly favored the Copernican world view meant he was headed for trouble with the Church. In fact, his Venetian friends warned him that it might be dangerous to leave the protection of the Venetian state. Third, I say that if there were a true demonstration that the sun is at the center of the world and the earth in the third heaven, and that the sun does not circle the earth but the earth circles the sun, then one would have to proceed with great care in explaining the Scriptures that appear contrary, and say rather that we do not understand them than that what is demonstrated is false. But I will not believe that there is such a demonstration, until it is shown me." This was far from a mindless rejection of the Copernican picture—it just demanded a more convincing demonstration. Somewhat earlier—Dec 1613—Galileo had written a letter to Castelli (a Benedictine abbot and former pupil of Galileo's) saying in essence that Scripture cannot contradict what we see in nature, so scripture, written for the business of saving souls and readable by everybody, sometimes is metaphorical in describing nature. It seems that Bellarmine and Galileo might have been able to come to some agreement on a world view. It was pointed out to him that a ball made of ebony sinks in water, but a flat chip of ebony floats. We now understand this in terms of surface tension, but that had not been understood in Galileo's time. Nevertheless, Galileo gave an essentially correct answer: he observed that the chip floated somewhat below the previous level of the surface, dragging the water down slightly around its edges,so one should consider the floating body to be the chip plus the thin sheet of air over it, and putting these together gives an average density equal to that of water. Galileo discussed problems of this kind with a Florentine patrician, Filippo Salviati, and a group of his acquaintances. As usual, Galileo's style and ability to pulverize the opposition did not win many friends. (see Drake, pages 49-51). Salviati appears as one of the three disputants in Galileo's Dialogue. One more source of tension between Galileo and the Jesuits arose at this point. Since 1611, Galileo had been observing the motion of sunspots: small dark spots on the surface of the sun, easily visible through a telescope at sunset. They were observed independently at about the same time by Christopher Scheiner, a German Jesuit from Ingoldstadt. (It is possible that Scheiner had somehow heard of Galileo's observations. )Scheiner thought they were small dark objects circling the sun at some distance, Galileo correctly surmised they were actually on the sun's surface, another blow to the perfect incorruptibility of a heavenly body. Galileo published his findings in 1613, with a preface asserting his priority of discovery. This greatly upset Scheiner. About this time, some members of another order of the Church, the Dominicans, were becoming aware of the Copernican world view, and began to preach against it. In 1613, Father Nicolo Lorini, a professor of ecclesiastical history in Florence, inveighed against the new astronomy, in particular "Ipernicus". (Sant p 25). He wrote a letter of apology after being reproved. In 1614, another Dominican, Father Tommaso Caccini, who had previously been reprimanded for rabble-rousing, preached a sermon with the text "Ye men of Galilee, why stand ye gazing up into the heaven?" He attacked mathematicians, and in particular Copernicus. (In the popular mind, mathematician tended to mean astrologer.) It should be added that these two were by no means representative of the order as a whole. The Dominican Preacher General, Father Luigi Maraffi, wrote Galileo an apology, saying "unfortunately I have to answer for all the idiocies that thirty or forty thousand brothers may or actually do commit". According to De Santillana (page 45) in 1615 Father Lorini sends an altered copy of Galileo's letter to Castelli (mentioned above) to the Inquisition. He made two changes, one of which was to go from "There are in scripture words which, taken in the strictly literal meaning, look as if they differ from the truth" to "which are false in the literal meaning". Still, the inquisitor who read it thought it passable, although open to being misconstrued. Nevertheless, in February 1616, the Copernican System was condemned. According to Drake (page 63): "A principal area of contention between Catholics and Protestants was freedom to interpret the Bible, which meant that any new Catholic interpretation could be used by the Protestants as leverage: if one reinterpretation could be made, why not wholesale reinterpretations? A dispute between the Dominicans and the Jesuits over certain issues of free will was still fresh in the pope's mind, as he had to take action in 1607 to stop members of the two great teaching orders from hurling charges of heresy at each other. These things suggest that Paul V, if not temperamentally anti-intellectual, had formed a habit of nipping in the bud any intellectual dispute that might grow into factionalism within the Church and become a source of strength for the contentions of the Protestants." The pope asked Bellarmine to convey the ruling against the Copernican system to Galileo. Bellarmine had a meeting with Galileo, and apparently there were also some Dominicans present. Just what happened at this meeting is not quite clear, at least to me. Later (in May) Galileo was given an affidavit by Bellarmine stating that he must no longer hold or defend the propositions that the earth moves and the sun doesn't. Another document, however, which was unsigned (and therefore perhaps of questionable accuracy), stated that the Commissary of the Inquisition, in the name of the pope, ordered that Galileo could no longer hold, defend or teach the two propositions (Drake, page 67). This second document was not given to Galileo. The inclusion of teach was a crucial difference:it meant Galileo couldn't even describe the Copernican system. A week later (early March) books describing a moving earth were placed on the Index of Prohibited Books, some pending correction. In Sarsi I seem to discern the belief that in philosophizing one must support oneself on the opinion of some celebrated author, as if our minds ought to remain completely sterile and barren unless wedded to the reasoning of someone else. Possibly he thinks that philosophy is a book of fiction by some author, like the Iliad... . Well, Sarsi, that is not how things are. Philosophy is written in this grand book of the universe, which stands continually open to our gaze. But the book cannot be understood unless one first learns to comprehend the language and to read the alphabet in which it is composed. It is written in the language of mathematics, and its characters are triangles, circles and other geometric figures, without which it is humanly impossible to understand a single word of it; without these, one wanders in a dark labyrinth. Naturally, this further alienated the Jesuits. In 1623, Galileo's admirer the Florentine Maffeo Barberini becomes Pope Urban VIII. The new pope saw himself as a widely educated man, who appreciated even Galileo's current theories. He had written a poem "In Dangerous Adulation" about Galileo's ideas. He also suggests his own pet theory to Galileo: even though the universe may be most simply understood by thinking of the sun at rest, God could have arranged it that way, but really with the earth at rest. Galileo worked on his new book, which he intended to call "Dialogue on the Tides", from 1624 to 1630. He was warned as he completed the work that that title seemed to imply he really held the view that the earth was moving, so he changed the title to Dialogue Concerning the Two Chief Systems of the World-Ptolemaic and Copernican. As usual, Galileo spared no-one in the book.He mocked the pope himself, by putting Urban's suggestion (see above) in the mouth of Simplicio, then dismissing it contemptuously (Reston, page 195). The book was published in March 1632 in Florence. In August, an order came from the Inquisition in Rome to stop publication, and Galileo was ordered to stand trial. Apparently, someone—probably Scheiner, now living in Rome—had shown the pope the unsigned memo from the 1616 meeting, forbidding Galileo even to describe the Copernican system. Galileo was not too upset at the thought of a trial, because he held a trump card: the affidavit from Bellarmine. At the trial, Galileo said he had no memory of being forbidden to teach, and no signed document could be found to support the unsigned memo. The trial did not address the scientific merits of the case, it was about whether or not Galileo had disobeyed an official order. It was suggested that he admit to some wrongdoing, and he would get off lightly. He agreed to tone down the Dialogue, pleading that he had been carried away by his own arguments. He was condemned to indefinite imprisonment, and, after some negotiation, was confined to his villa until his death in 1642. During this period, he wrote Two New Sciences, a book on the strength of materials and on the science of motion. Take note, theologians, that in your desire to make matters of faith out of propositions relating to the fixity of sun and earth, you run the risk of eventually having to condemn as heretics those who would declare the earth to stand still and the sun to change position-eventually, I say, at such a time as it might be physically or logically proved that the earth moves and the sun stands still. (Quoted in Drake, page 62).